Popping wheelies that last a couple of metres is hard enough. But not for Masaru Abe. 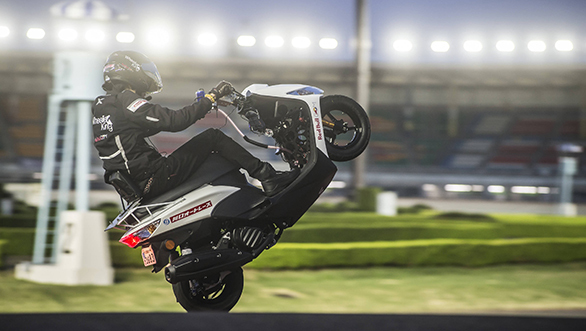 He just broke the world record for the longest held wheelie on a motorcycle. He held a wheelie on a scooter, a Yamaha Jog 125, for a stunning 500.5322km! To put things into perspective, that's the same as going from Mumbai in Maharashtra to Belagavi in Karnataka. And it took him over 13 hours to do it! While the previous record, at 331.0915km, is no joke, Abe's record-breaking attempt takes it to a whole new level. And here's a video of him doing it. Abe performed the wheelie at the Kawaguchi Auto Race facility in Saitama, Japan. He maintained a speed of around 40kmph throughout the run with constant throttle modulation. Watch the video to see how he managed to hydrate himself and just how challenging the feat was. Abe calls himself Wheelie King and after this stint, he certainly earned the title.